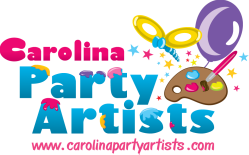 Welcome to Carolina Party Artists' website! We are a family owned and operated business in Summerville, SC. Looking for more? Ask about our Glitter Nails, Games and Crafts for kids of all ages- call for details and to see if these services are a good fit foryour event! We hope you will take a few minutes to view sample photos of our work on the next pages and imagine how our services can enhance your next party or special event. Give us a call or email for more information& availability. *Please remember weekends fill up quickly for our artists so even if you don't know all the details of your event, check in with us about your date/time early! Weekends can fill up quickly so please try and contact us early in your planning process! ~Please "lIKE " US while you are there! ~Upload your favorite photos of our services at your party or special event! ~Let others know what you think of what we do! Your help in spreading the word about us helps us GROW! Contact us anytime to reserve one or a whole team of artists to entertain guests of all ages at your next special event. Custom Packages can include face painting, glitter tattoos, balloon twisting or game time. Let our party artists team add loads of fun at your next Company Picnic, Special Promotion, Trade Show, Grand Opening, or Celebration of any kind! We have worked for, in and around Charleston.